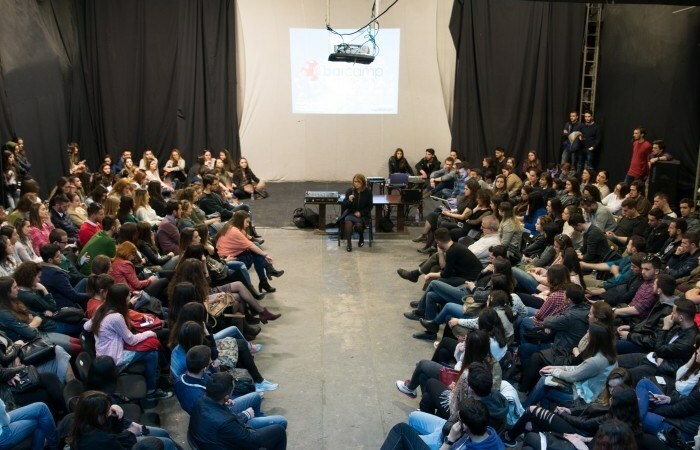 The 36th edition of BarCamp Prishtina showed us how imagination shapes our reality. This edition covered topics related to programming, acting, inventing, composing and making dreams a reality. Taking place last Wednesday night at Oda Theatre, the house was full with around 300 participants. The ones who attended this BarCamp were folks with the spirit of inquiry, very ardent to listen to the life experiences of three super-interesting fellows. Have you ever wondered how programming looked like during 80’s in Kosovo? What it felt like to be the inventor of an instrument which is the first invention of its kind after lahuta and çiftelia? How it was like to present a concrete-touching event by escorting a powerful message with an artistic short movie? How was the feeling of being part of the OSCARS Academy? Staggering, huh? Well, this rah-rah edition of BCPR #36 covered all these topics and much more. Speakers of this edition were: Eshref Durmishi, Merita Mita and Liburn Jupolli. Eshref Durmishi is one of the country’s most established actors working across TV, Film & Theatre. He gained international success playing the lead role in the Greek / German co-production film Eduart. He also produced and starred in the Oscar Nominated film ‘Shok’ which portrayed elements of his life. “The moment of nomination at the Oscars was the moment I dreamed for many times, and there I realized that dreams can become a reality”, said Durmishi in the 36th edition of BarCamp Prishtina. Merita Mita, an electrotechnics engineer and a professional violin teacher born in Peje and raised in Prishtina, worked for 16 years as “Data Processing Organizer” and was one of the first females in the ICT sector in Kosovo. During her presentation, Merita explained the obstacles and the struggle of coding without having a personal computer. “After the war I didn’t have the chance to continue being a programmer. Hence, my husband & I together created the “Lumi” bakery ten years ago,” thereby ending her professional career in data processing. Liburn Jupolli, a composer, pianist and an inventor born and raised in Prishtina, is the inventor of five unique instruments. He writes for all existing instruments starting from çifteli and likes to experiment with music. Currently, he is studying composition at CRR in Paris. “To be an inventor means to sacrifice a lot and it is kind of dangerous because the final product may not be well-liked by everyone”. At the end, what is more awesome than hearing such socko & inspiring stories from the speakers was the interaction with the audience who were quite active with thoughts, comments and questions. Forget about that oldish proverb “Curiosity killed the cat”, explore and question things everyday because remember, curiosity is knowledge! See you next month!